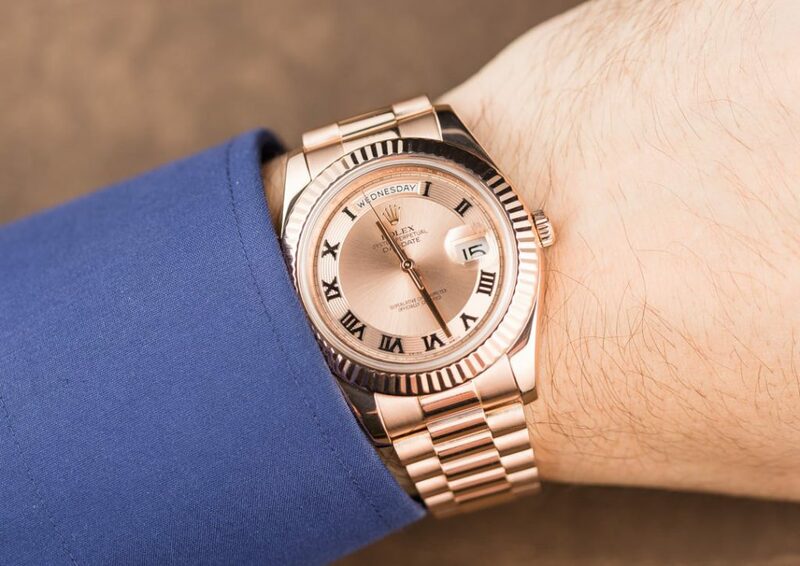 A luxury watch that doesn’t shy away from attention, this particular Rolex President is entirely dressed in 18k Everose pink gold. From the now discontinued Rolex Day-Date II collection, the ref. 218235 sports a 41mm case — the largest of the Rolex President series. In 2008, Rolex first introduced the Day-Date II collection, augmenting the size of the traditional Presidents’ 36mm diameter to 41mm in response to the growing trend for larger men’s watches. The Day-Date II series only lasted a few years with the brand introducing the Day-Date 40 in 2015 and ultimately shelving the Day-Date II. For those who lean towards oversized watches, the Day-Date II is a great choice. Sitting on top of the case is a fluted bezel, a very familiar Rolex design trait, that keeps the scratch resistant sapphire crystal in place to protect the dial. Affixed onto the crystal is the famed Cyclops lens magnifying the date window at 3 o’clock. Coupled with the day at 12 o’clock, the calendar functions of the Day-Date are very practical indeed. In fact, when the very first Rolex President was unveiled in 1956, it was the first wristwatch of its kind to display both the day written in full and the date. 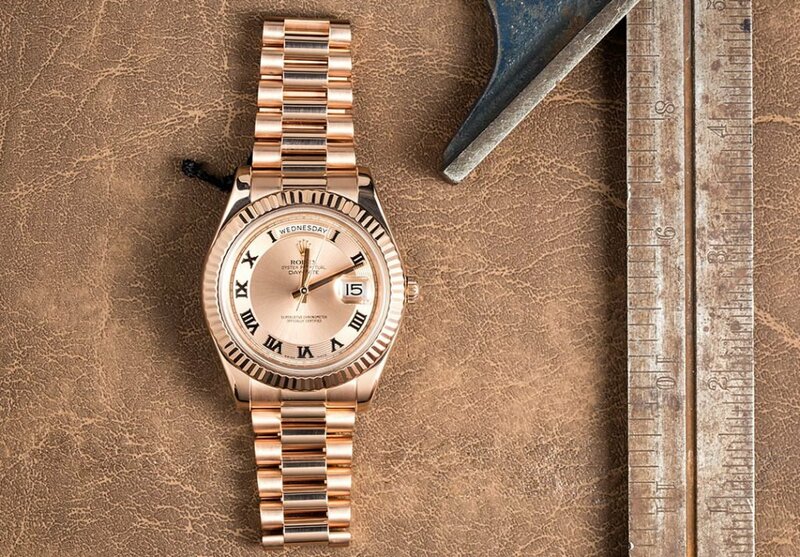 The matching pink gold dial is accented by concentric circles that give the face of the watch interesting depth, while the black Roman numerals add a touch of tradition. The Day-Date President ref. 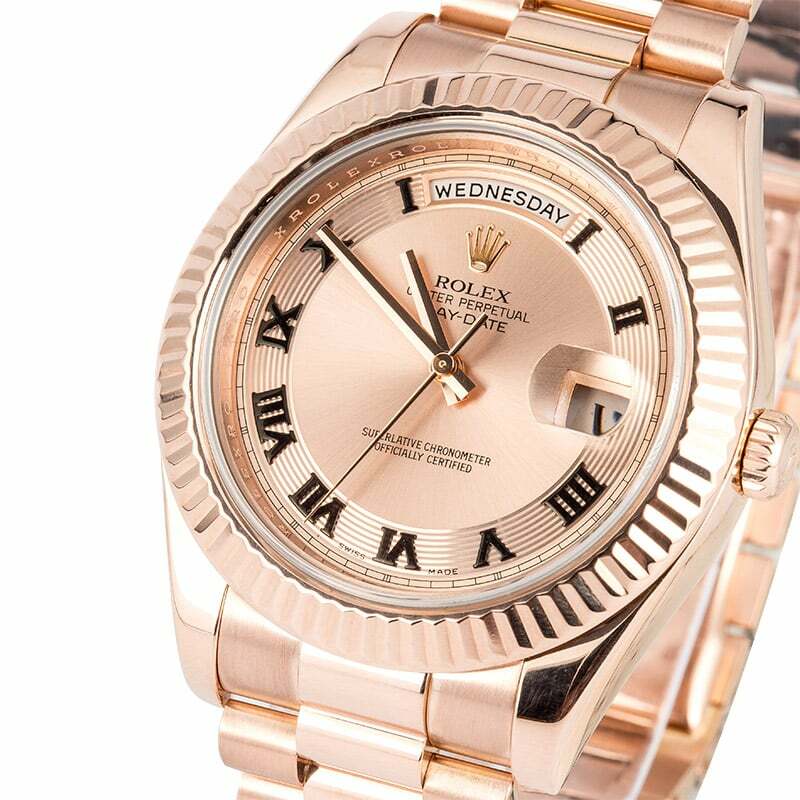 218235 also features the engraved “ROLEX ROLEX ROLEX” rehaut — an anti-counterfeit measure Rolex introduced in the mid-2000s. Beating at the heart of the Rolex President 218235 is the Caliber 3156 automatic mechanical movement. The COSC-certified caliber boasts the Paraflex shock absorbers for added resilience and the Parachrom blue hairspring for increased magnetic resistance. Encased in the hermetically sealed Oyster case and protected by the Twinlock screw-down winding crown, the movement within the Day-Date 218235 is water resistant to 330 feet (100 meters). 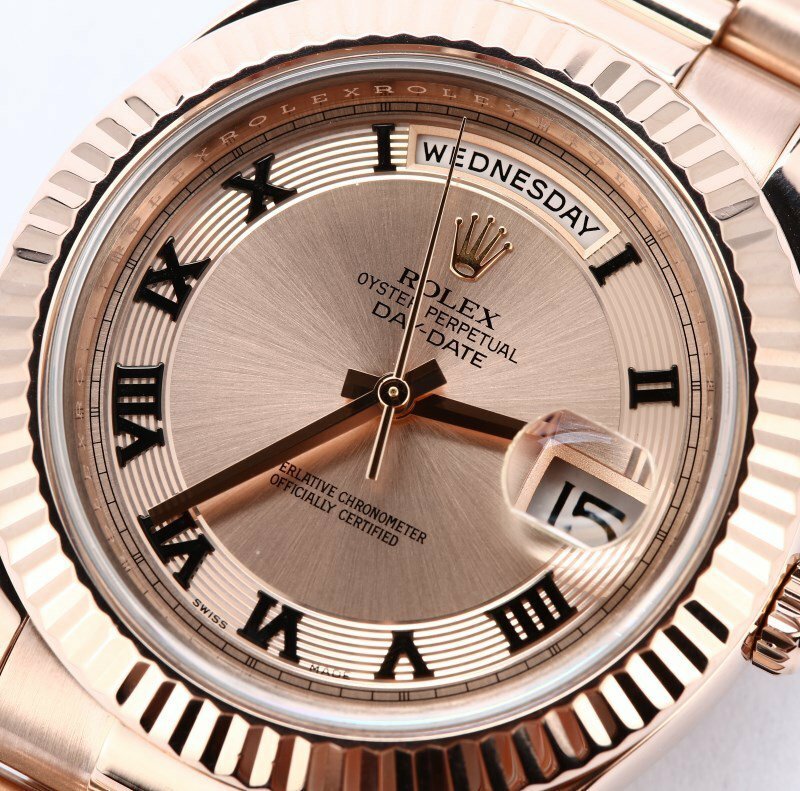 The Day-Date II is of course presented on the Rolex President bracelet — one of the reasons for the watch’s nickname — distinguished by its semi-circular three-link bracelet construction. 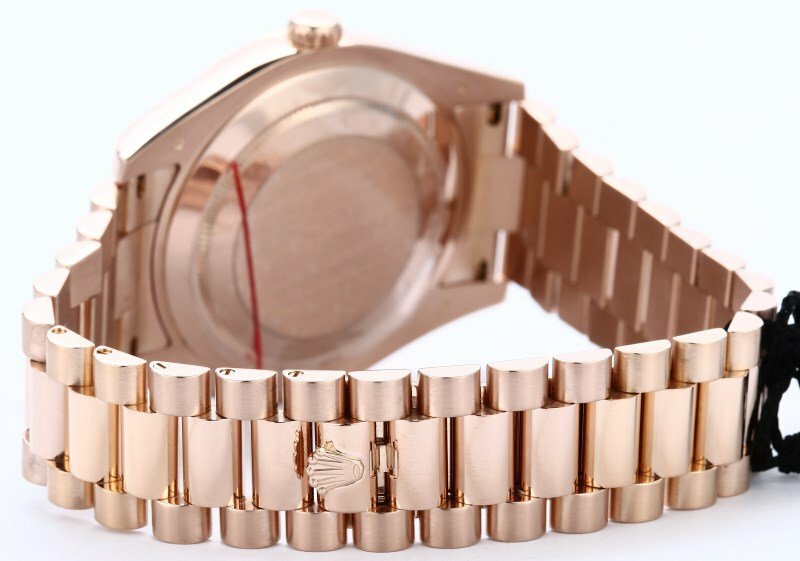 Also crafted in 18k Everose gold, the design of the President bracelet is immediately recognizable. The center links of the bracelet are polished while the two outer links have a brushed finish and the bracelet is outfitted with the hidden Oysterclasp deployant. A favorite among world leaders, celebrities, and business moguls, the Rolex President is a watch that symbolizes success. And among the three sizes offered within the Rolex Presidents, the Day-Date II is the most masculine and robust. Expensive, prestigious, and iconic, the President ref. 218235 is a watch that speaks volumes.